The rotation, or movement, of one eye to the right. 1. To move or place to the right: Mr. Stevens asked that the vase be placed in a dextroposition to its original location on the shelf. 2. Displacement to the right; such as, a body part: Tony, the pianist, favored the dextroposition of his hands when he was playing his special musical presentation. 1. The weakening or reducing the concentration of something with a thinner: The recipe called for a dilution of one part concentrate to two parts water. 2. A thinning of a medium, usually a liquid, by the addition of another element; such as, water: Typically the dilution of frozen juice is done to a specific ratio. 1. A lessening, decreasing, or reduction of something, or the result of such a reduction. 2. 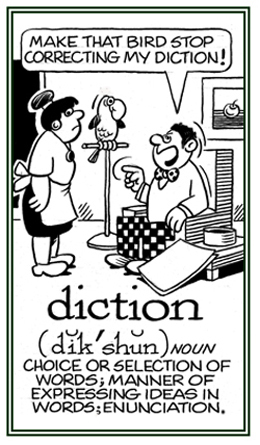 The act, fact, or process of diminishing; lessening; reduction: "His uncle was experiencing a diminution of his wealth." 3. The repetition of a musical phrase, using notes that are of a shorter duration than in the original phrase. 1. A theoretical line, physically or mentally, that is followed from a point of origin or towards a destination or place: Ben was told to keep going in the same direction up the street and the restaurant that he is looking for can be seen on the corner. The sign on the path showed the hikers the direction to go in order to reach the lake. 2. A general trend, guidance, or instruction for future action: The musicians waited for the bandleader to give them more directions. 3. The work of a producer in movies or theater dramas: The screenplay was very good; however, some people thought the direction was not as good as it should have been. 4. A location from which a person or something can be observed: The house on the hill had beautiful views in all directions because it had windows on all sides. 5. Instructions that indicate how a person can achieve an objective: Grace read the directions in her cookbook to find out how to make spaghetti sauce. 6. The guidance or supervision of something or someone: Because of a lack of parental direction and support, Sally spent most of her time playing video games and watching TV and not doing her homework properly. 1. The good judgment and sensitivity needed to avoid embarrassing or upsetting others. 2. The freedom or authority to judge something or to make a decision about it. 3. Etymology: from Late Latin discretionem, "discernment, power to make distinctions"; from Latin discretionem, "separation, distinction"; from discre-, the stem of discernere, "to separate, to distinguish". An elaborate or a long written and detailed essay or a long discussion about a special topic: A disquisition is not a very successful presentation for a TV or a radio show because it is simply too complicated or takes up too much time. Showing page 9 out of 21 pages of 308 main-word entries or main-word-entry groups.